Adjust the eye, nose, mouth, and eyebrow points to exactly match your imported picture. Select Pan tool and drag a point to move it or drag on a contour (ex. the mouth contour) to move the group of points. Select Zoom tool and drag on a contour to scale the group of points. Check Mirror option to adjust the points symmetrically, uncheck it to switch to independent point adjustment. The default setting is on. Use Dropper tool to pick the middle tone of the skin color. iClone samples the skin tone automatically for matching the skin color. Check how the front photo blends with the profile image, if the skin tone doesn’t match properly (this could happen when the face is covered by something or the contrast of the photo is too high ), you can pick the middle skin color manually and check the 3d head to get a better result. 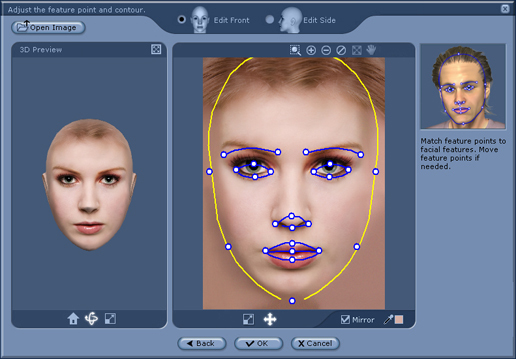 When the features and contours on the front of the face are properly set, click the Edit Side button to set the profile if nessary. Move the points or the group of points the same way as front. Drag the 2 vertical lines to define the texture blend area and check the result on the 3D head. You can import your own profile photo by clicking Open Image button. Click the OK button when you are happy with your settings. When the following dialog box appears, click the yes button to apply the changes. Give the 3D head a name and save it in the default facial folder. The new head you have created is automatically applied to the current project. 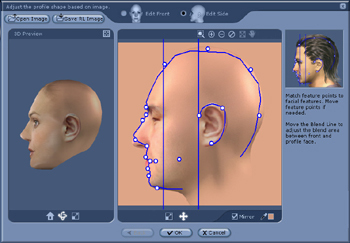 You have now created a 3D head that can be applied to any new project by double-clicking it. The new head you have created can be found in the list of custom faces. To find a custom face, click the facial button to begin facial settings and click the Custom tab to display the list of custom heads.